I love a good list to inspire, validate, and remind. I curate a collection of short leadership snippets on Scoop.It. 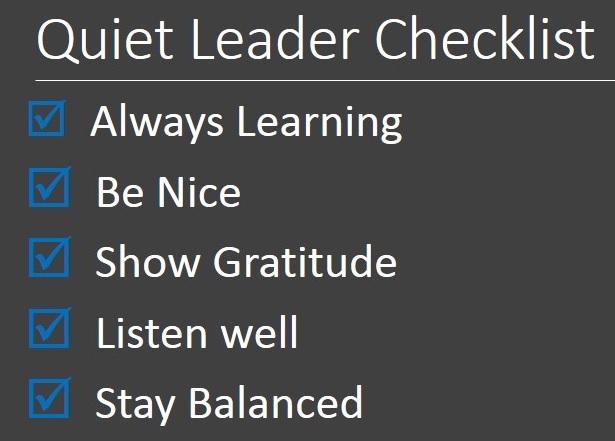 Use these lists to inspire and remind you to lead quietly. Join me in this effort by Tweeting your favorite leadership related lists with the hashtag #LdrLst. What do you mean by charisma? This blog is dedicated to quiet leaders who do the right thing with quiet, behind-the-scenes actions, not public heroism. Read the first post, "Release Notes." I am a student of leadership with a quiet profile. In my day job, I am an IT manager and data architect working in the Minneapolis area. Quiet Leader "Hall of Fame"